Who likes free stuff? I know I do. Who likes captioning random pictures? Yes. Have some. For the first contest in my ten-thousand part series, I’m offering a sparkly, brand-spanking-new softcover edition of Down the Dark Path. If you win, I’ll sign the inside cover, box it up, and ship it to your house (on my dime) wrapped in a scrumptious bouquet of potpourri and ancient Mayan bone fragments. Ok, that last part is only partly true. The fragments will probably belong to my neighbors. I prefer to shop locally. Anyway, the rules are simple. Whoever’s caption of the G-Man sporting his new ink amuses me the most…wins. Add your comment in the comments section of the blog, and I’ll choose a winner. All entries must be submitted by Friday, Nov 15th at Midnight. If you win, I’ll contact you somehow (probably by knocking at your door, a la the dead son in my favorite short story of all time, The Monkey’s Paw) and snag your shipping address. No international requests, please. Unless you’re a publisher. And rich. Or if you’re Ken Jeong. 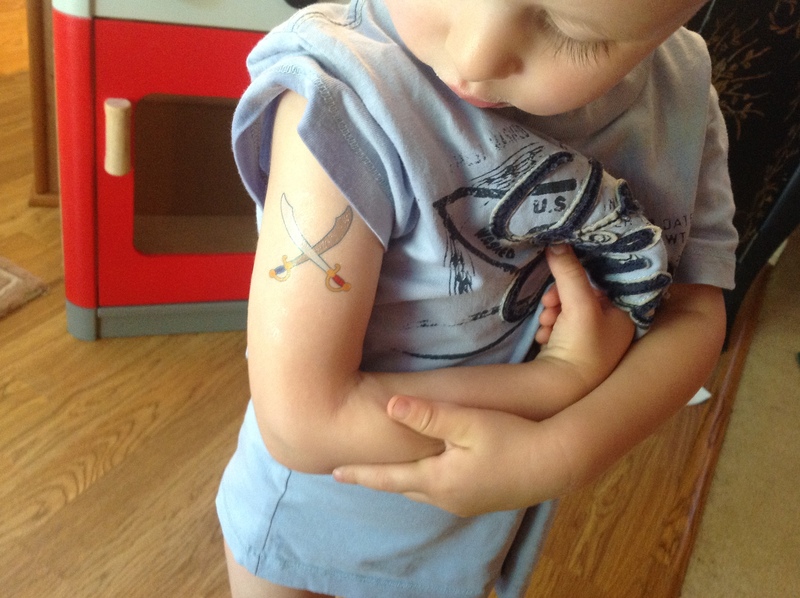 Tagged awesome, bicep, freebie, kid, swords, tattoo, tough. The Man Code: Never bring a knife to a gun fight, but always bring swords to the gun show. That was one heck of a kindergarten Christmas party. I got drunk off egg nog & woke up with this tattoo. How am I gonna explain this to my mom! Today was the day I realized a toddler has bigger biceps than I do. DADDY! DADDY! LOOK WHAT THE CAT DRAWED ON ME!! She took my pants tho…oh wait, I left those next to mommy’s crack pipe. You guys are pretty good at this. I’ll definitely need to do more of these. Midnight tonight, I’ll pick the winner.